The political zinger of the year may not have come from the Israeli, United Kingdom or Nigerian elections. Rather, it came from a Kurd in Turkey's election, in a race likely to reverberate beyond the Middle East. And it pokes fun at the increasingly autocratic Turkish President Erdogan. Recep Tayyip Erdogan may not be on the ballot, but his rule is at state. Currently, he's a ceremonial president, not supposed to get involved in politics. But he's breaking that rule in every way he can to help his party, the AKP, win enough votes to make him the most powerful president in the world. As a result, he's attending nearly every grand opening he can to get on television and in the papers. To make fun of this, the young Kurdish leader of the HDP took a humorous jibe at this. "The President of Turkey is attending all of these grand openings," a Turk relayed the joke to me. "So I am attending the grand opening of this Coke bottle." 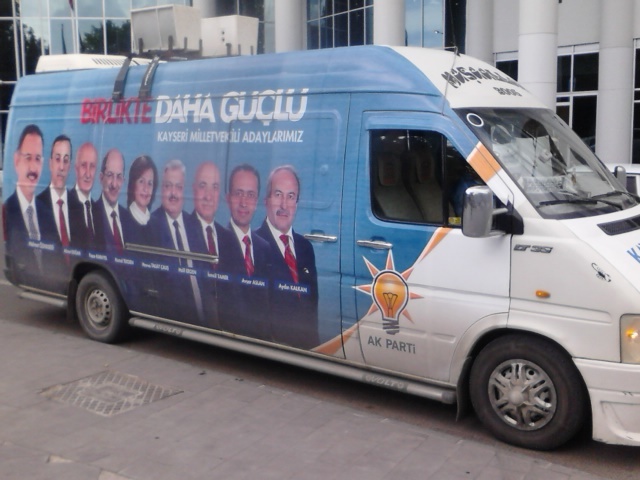 But it's not always a laughing matter for the Turkish opposition parties. Erdogan always seems to be on the airwaves, even if there aren't TV ads, though his position is supposed to be non-partisan and ceremonial. There are posters everywhere, and the streets are filled with tons of orange, blue and white flags and streamers. Turks told me that's because the parties with more seats get more campaign cash. It's like the old "make it, take it" basketball game kids play, which favors the winner instead of creating a level playing field. In the Turkish countryside, there are few examples of an election outside of a few posters, but in Istanbul, Kayseri, Bursa or Izmir, it's a different story. 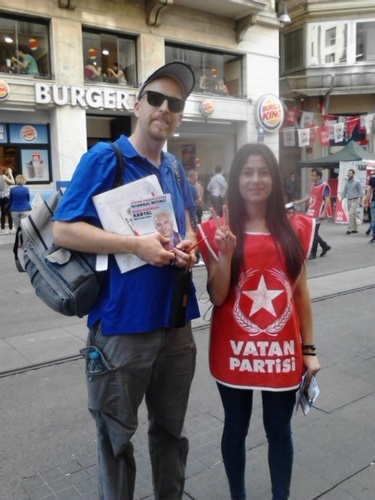 The opposition parties are doing all they can, and you can find it in their flags, supporters handing out leaflets and rallies. But the problem may be that there are too many of them. 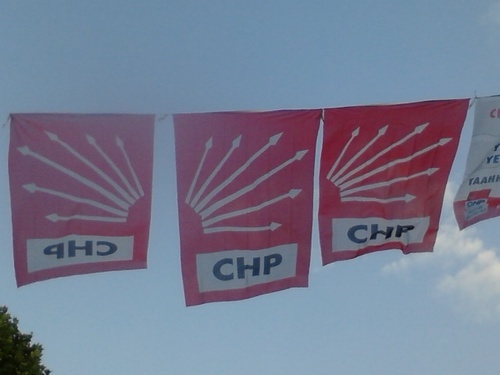 The CHP is out there, but so is the MHP, HDP, VP, BHP, etc. 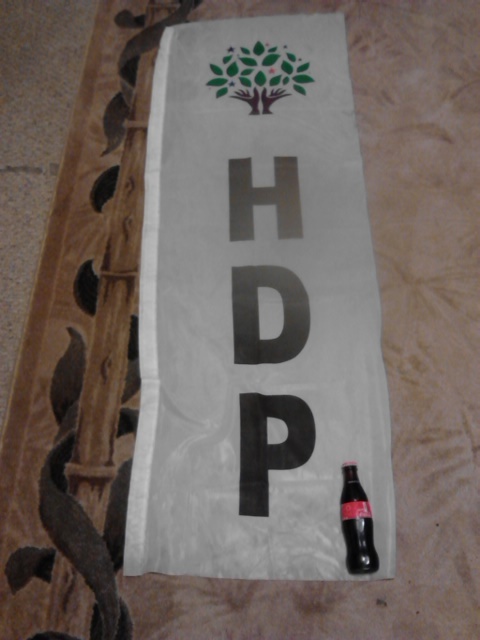 I got to witness a particularly boisterous march by the supporters of another party, Saadet. They got into a shouting match with one of the many AKP vans, blaring out messages on a loudspeaker like a throwback to the politics of the "Back to the Future" movies. All must clear the threshold of 10 percent, according to the rules, or lose all chance of getting any seats, which would allow the AKP to get an even bigger seat percentage than vote percentage. A vendor who told me he was an MHP supporter worried aloud about his party's chances, either from the election rules or knowledge of who will be counting the votes. The stakes are pretty high, according to Graham Fuller, the former Vice-President of the CIA's National Intelligence Council. Writing in the Huffington Post, he had this to say about the 2015 election. 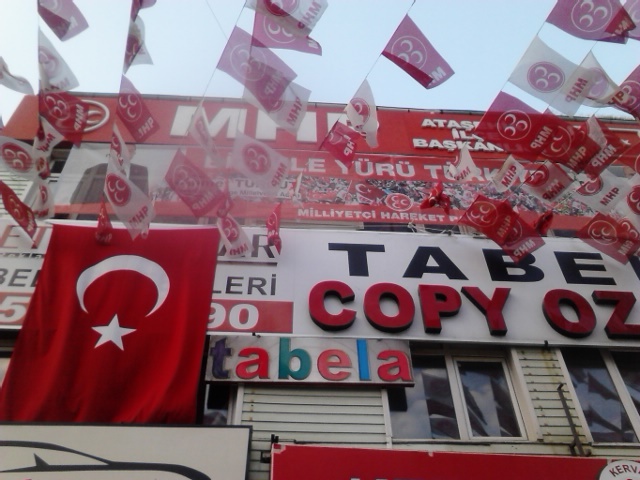 On June 7, Turkey's democratic system will be deeply tested in a fateful parliamentary election. At stake is preservation of rule of law and liberal democracy against an increasingly authoritarian-minded president. Bottom line: if President Erdoğan's AKP party is able to win big, the entire system of separation of powers in Turkey will likely reach breaking point. Erdoğan will have gained the carte blanche he seeks to mold, shape and steer the state any direction he wants in a semi-legal form of one man rule. And this comes at a time when his presidency has become ever more erratic, arbitrary, error-prone, corrupt, vengeful and out of touch. I asked voters why there wasn't an opposition coalition to stop Erdogan. This is due to the widely divergent party platforms, from the secular social democratic CHP to the secular free market MHP, to the pro-Islamic Saadet, to the Kurdish HDP (which the AKP claims is linked to the Kurdish PKK terrorists) and the Communist VP. 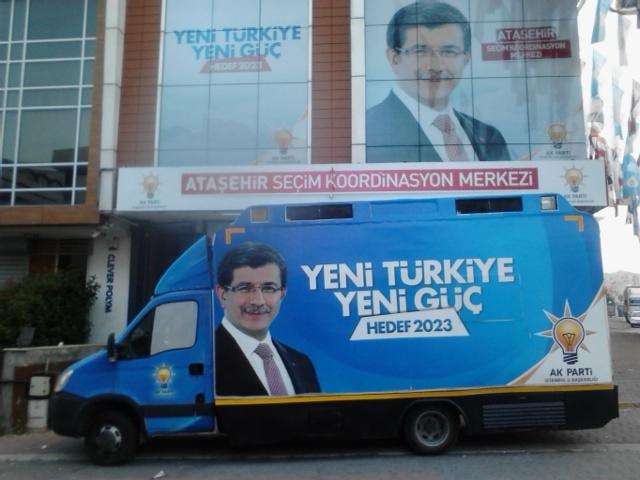 These contrast with the AKP, which tries to be all things to all people. Posters focused on what the AKP did and will do for the Turks. Barring a miracle, the AKP will be the first party, even if it doesn't win enough votes to hand the country over to Erdogan in a new presidential system.